Schinus terebinthifolius is a species of flowering plant in the cashew family, Anacardiaceae, that is native to subtropical and tropical South America (southeastern Brazil, northern Argentina, and Paraguay). It is found in these states of Brazil: Alagoas, Bahia, Espírito Santo, Mato Grosso do Sul, Minas Gerais, Pernambuco, Paraná, Rio de Janeiro, Rio Grande do Norte, Rio Grande do Sul, Santa Catarina, São Paulo, and Sergipe. Common names include Brazilian peppertree, aroeira, rose pepper, broadleaved pepper tree, wilelaiki (or wililaiki), Christmasberry tree and Florida holly. Brazilian pepper is widely grown as an ornamental plant in frost-free regions of South America for its foliage and fruit. It is considered as a melliferous flower and is the main source of food for the bee Tetragonisca angustula, which is an important honey producer. Although it is not a true pepper (Piper), its dried drupes are often sold as pink peppercorns, as are the fruits from the related species Schinus molle (Peruvian peppertree). The seeds can be used as a spice, adding a pepper-like taste to food. They are usually sold in a dry state and have a bright pink color. They are less often sold pickled in brine, where they have a dull, almost green hue. Brazilian pepper is hard to control because it produces basal shoots if the trunk is cut. Trees also produce abundant seeds that are dispersed by birds and ants. This same hardiness makes the tree highly useful for reforestation in its native environment, but enables it to become invasive outside of its natural range. 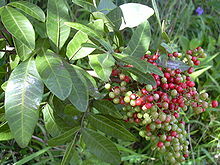 Like many other species in the family Anacardiaceae, Brazilian pepper has an aromatic sap that can cause skin reactions (similar to poison ivy burns) in some sensitive people – although the reaction is usually weaker than that induced by touch of the closely related Lithraea molleoides, known in Brazil as “wild” aroeira (aroeira brava). Conversely, Schinus terebinthifolius is commonly known as “tame” aroeira (aroeira mansa). The burning of plant matter releases many airborne irritants, so it is not an effective means of control. It is said to have a “mace-like” effect upon nearby people and is highly advised against. Also known as “Florida holly”, Schinus terebinthifolia was introduced to Florida by at latest 1891, probably earlier, where it has spread rapidly since about 1940, replacing native plants, like mangroves, with thousands of acres occupied. It is especially adept at colonizing disturbed sites and can grow in both wet and dry conditions. Its growth habit allows it to climb over understory trees and invade mature canopies, forming thickets that choke out most other plants. The species, including the seed, is legally prohibited from sale, transport, or planting in Florida, according to the Florida Department of Agriculture and Consumer Services Noxious Weed List. It is classified as a Category I pest by The Florida Exotic Pest Plant Council (FL EPPC). To keep the plant from spreading into native plant communities and displacing them, local regulations and environmental guidelines require eradication of Brazilian pepper wherever possible. The plant and all parts are also illegal for sale or transfer in Texas. As one of the two species sold as pink peppercorn, the other being Schinus molle, it lacks generally recognized as safe (GRAS) status with the FDA. Peppertree is the subject of extensive folk medicinal lore where it is indigenous. Virtually all parts of this tropical tree, including its leaves, bark, fruit, seeds, resin and oleoresin (or balsam) have been used medicinally by indigenous peoples throughout the tropics. The plant has a very long history of use and appears in ancient religious artifacts and on idols among some of the ancient Chilean Amerindians. Throughout South and Central America, Brazilian peppertree is reported to be an astringent, antibacterial, diuretic, digestive stimulant, tonic, antiviral and wound healer. In Peru, the sap is used as a mild laxative and a diuretic and the entire plant is used externally for fractures and as a topical antiseptic. The oleoresin is used externally as a wound healer, to stop bleeding and for toothaches and it is taken internally for rheumatism and as a purgative. In South Africa, a leaf tea is used to treat colds and a leaf decoction is inhaled for colds, hypertension, depression and irregular heartbeat. In the Brazilian Amazon, a bark tea is used as a laxative and a bark-and-leaf tea is used as a stimulant and antidepressant. In Argentina, a decoction is made with the dried leaves and is taken for menstrual disorders and is also used for respiratory and urinary tract infections and disorders. ^ “Schinus terebinthifolia“. Germplasm Resources Information Network (GRIN). Agricultural Research Service (ARS), United States Department of Agriculture (USDA). Retrieved 2009-12-30. ^ “Schinus terebinthifolius“. Natural Resources Conservation Service PLANTS Database. USDA. Retrieved 6 November 2015. ^ “Broadleaved pepper tree (Schinus terebinthifolius)”. www.daf.qld.gov.au. Retrieved 2015-07-19. ^ “Christmas-berry” (PDF). Retrieved 2016-12-04. ^ “Brazilian-pepper tree, Christmasberry tree, Florida Holly”. Floridagardener.com. Retrieved 2017-10-06. ^ Braga, JA; Sales, EO; Soares Neto, J; Conde, MM; Barth, OM; Maria, CL (December 2012). “Floral sources to Tetragonisca angustula (Hymenoptera: Apidae) and their pollen morphology in a Southeastern Brazilian Atlantic Forest”. Revista de Biologia Tropical. 60 (#4): 1491–501. doi:10.15517/rbt.v60i4.2067. PMID 23342504. ^ “Schinus terebinthifolius; Element stewardship abstract” (PDF). Archived from the original (PDF) on February 21, 2007. ^ Morton, J.F. 1978. Brazilian pepper – Its impact on people, animals and the environment. Econ. Bot.32: 353-359. ^ Gogue, G. J.; Hurst, C. J.; Bancroft, L. (1974). “Growth inhibition by Schinus terebinthifolius”. HortScience. 9 (#3): 301. ^ “Florida Exotic Pest Plant Council Invasive Plant Lists”. Fleppc.org. Retrieved 19 July 2018. ^ “Texas Invasives”. Info.sos.state.tx.us. Archived from the original on 2012-10-24. Retrieved 19 July 2018. ^ Singh, Ram J.; Lebeda, Ales; Tucker, Arthur O. (2011). “2. Medicinal Plants—Nature’s Pharmacy”. In Singh, Ram J. Genetic Resources, Chromosome Engineering, and Crop Improvement: Medicinal Plants. 6. CRC Press (published 15 September 2011). p. 17. ISBN 978-1420073843. ^ “Broadleaved pepper tree Schinus terebinthifolius Declared Class 3″ (PDF). Daff.qld.gov.au. Archived from the original (PDF) on 2013-05-31. Retrieved 19 July 2018. ^ “Swan Weeds — List of Weeds”. Florabase.dec.wa.gov.au. Retrieved 19 July 2018. ^ “Invasive Alien Plants – CARA List”. South African Nursery Association. Archived from the original on 2013-03-13. Retrieved 2013-03-26. ^ “Tropical Plant Database File for – Brazilian Peppertree – Schinus molle”. Rain-tree.com. Retrieved 19 July 2018. ^ “Common weed could help fight deadly superbug, study finds”. Washingtonpost.com. Retrieved 19 July 2018. Species Profile – Brazilian Peppertree (Schinus terebinthifolius), National Invasive Species Information Center, United States National Agricultural Library. Lists general information and resources for Brazilian peppertree.